East of the Sun and West of the Moon | KaBOOM! "Once upon a time there was a poor peasant who had so many children that he did not have enough of either food or clothing to give them. Pretty children they all were, but the prettiest was the youngest daughter, who was so lovely there was no end to her loveliness." Thus begins the Norwegian fairytale, "East of the Sun and West of the Moon." It tells the tale of a poor girl who must make a perilous journey to break the spell placed upon her beloved, a prince who has been transformed into a polar bear. 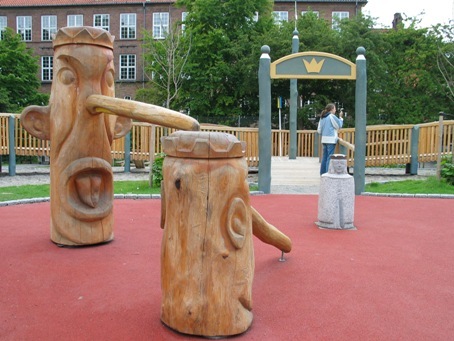 This fairytale was the inspiration of Stine Cecilie Brink, a landscape architect, when she sat down to design a universally accessible playground in south-eastern Copenhagen. Why not let children relive the girl's journey by "testing" them as she had been tested, and bringing the story's imaginative characters to life? It would take lots of creativity, patience, and skill, but Brink and her team were not faint of heart, so the journey commenced. "I have a stepmother who has bewitched me, so that I am a white bear by day and a man by night. She lives in a castle east of the sun and west of the moon, and there, too, is a princess, one with a nose three yards long." This long-nosed princess is just one of the many fairytale characters featured throughout the playground. These statues (made of "all natural ingredients") are not only visually amusing, but can be touched and climbed upon by visitors who enthusiastically act out the story. Various plants and flowers also add to the sensory experience, and children are encouraged to feel and explore these elements. Winding paths across the hilly grounds are designed with various degrees of slopes, allowing children in wheelchairs and on foot to choose the "just right" challenge for themselves. Although the playground was designed with accessibility as a top priority, it is challenging for children of all abilities, providing a special path that contains different obstacles for them to undertake. They can develop motor skills by jumping, crawling, and climbing from one station to the next, catching, throwing, balancing, and navigating different surfaces along the way. Just like the girl in the fairytale, they can conquer obstacles to reach their destination. "She wanted to and had to get there if it were at all possible; and she wouldn't be afraid, however madly he went." The playground's project manager, Helle Nebelong, is no stranger to creative and accessible natural environments for children and adults. 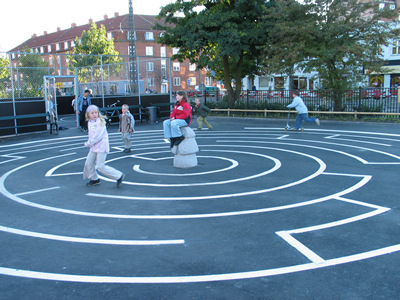 A Danish landscape artist, she has worked for the city of Copenhagen for 13 years in urban design and planning, and has recently developed a plan to improve accessibility throughout the city. 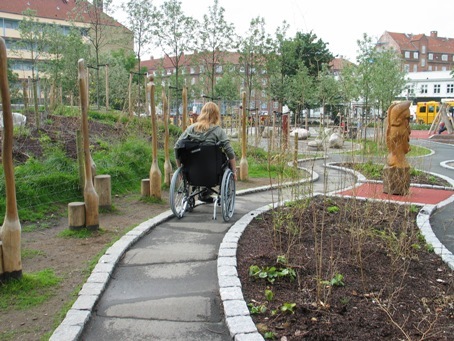 Nebelong's private practice, sansehaver.dk/, specializes in the design of natural spaces for children, young people with disabilities, and senior citizens. Her vision for the East of the Sun and West of the Moon playground was for it to become "a public place for all children to come irrespective of age, rank, ability, disadvantages, and competencies." Thanks to the hard work of Nebelong, Brink, local artists, and craftsmen (who became experts at carving figurines and play equipment out of granite and tree trunks), this vision has been realized. In 2003 East of the Sun and West of the Moon opened to the public, and has been delighting children and adults alike ever since. It is, of course, a happy ending. "As for the prince and princess...they took with them all the silver and gold, and flew away as far as they could from the castle that lay east of the sun and west of the moon."